I’ve been testing out some new recipes over the last month and improving some existing ones. Remember those Bailey’s Hot Cocoa Cupcakes? They’re new and improved and even more boozy. But I’m saving that for later. Today is, yet another, one of my favorite kinds of days-a snow day! I mean, I will be 85, working at the library and still get excited over a snow day. 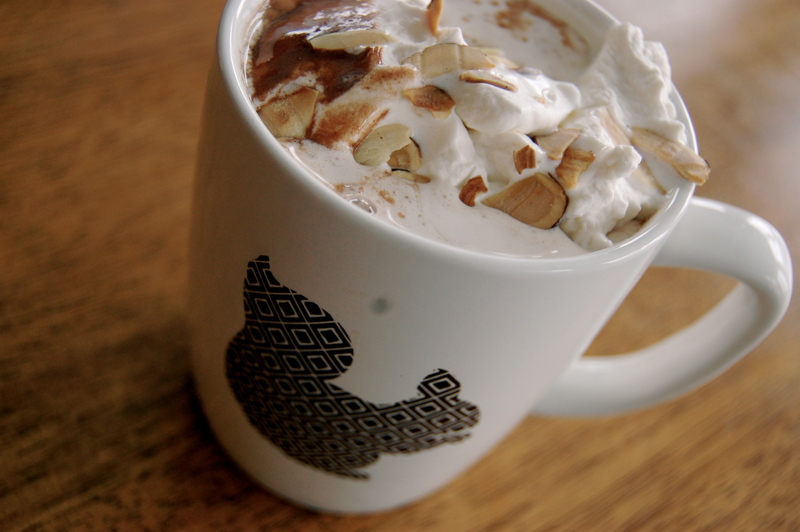 What’s more snow day appropriate than some hot cocoa… with a little bit of alcohol in it. Okay a lot a bit of alcohol in it. 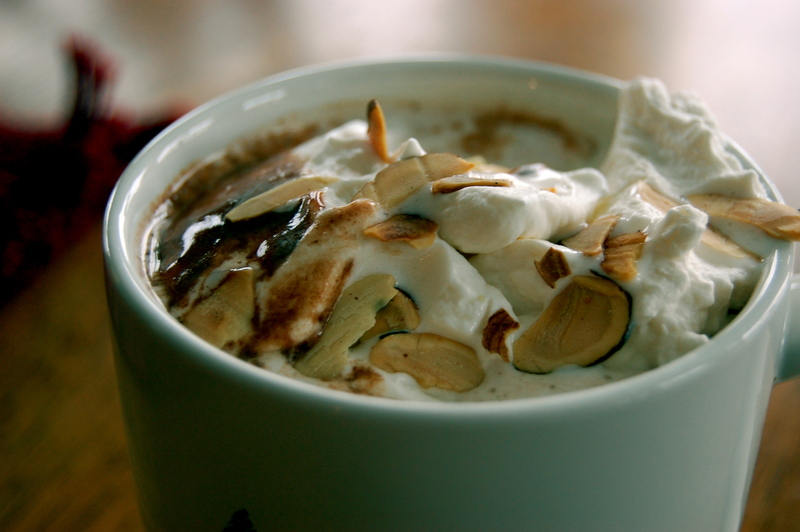 As I drove home from work this morning, snow day remember, all I could think about was pouring myself a warm, smooth mug of toasted almond hot cocoa. Just slip into some sweat pants, put on some Food Network, and sip on the good stuff. That’s life right there. 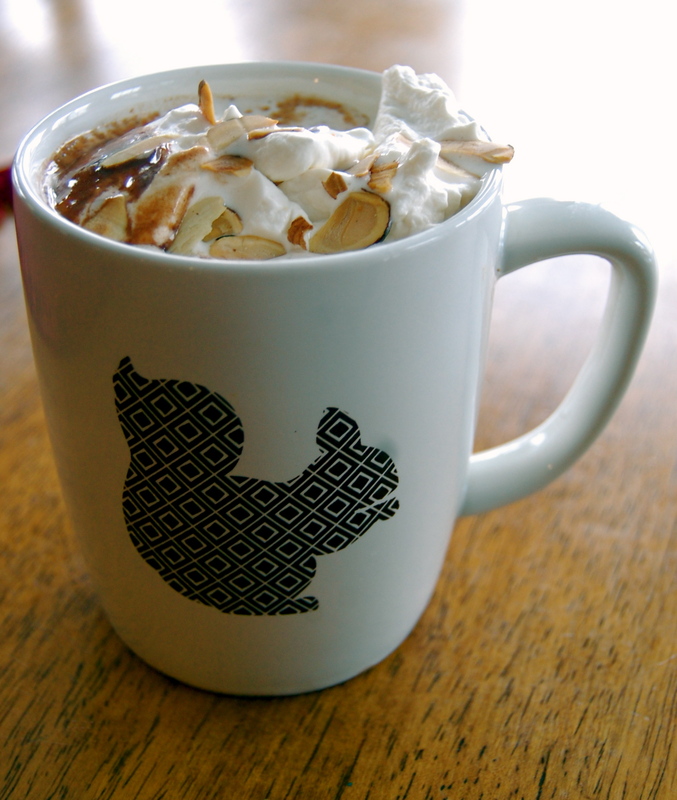 Now I did this version of hot cocoa a little different. Starting with the milk, I used vanilla flavored almond milk. But of course, you can use 2% or whatever is in your fridge. I’m very weird with milk and can’t stand the texture- yes, there is a texture to milk and it makes my skin crawl! But the almond milk is A-okay by me. I also used chocolate chips instead of either a chocolate syrup or cocoa powder, which is what I usually use. I figure, the sweat pants are already on-bring on the rich chocolate goodness! You can leave the amaretto out so this is a kid-friendly recipe. With the booze and without the booze, it’s delicious. P.S. you like this mug? Almonds-nuts-squirrels- get it? I thought it was clever. Directions: In a sauce pan, heat on low heat the milk, chocolate chips, almond extract, amaretto, and 2 teaspoons of sugar. Bring to a simmer and remove from heat. In a small pan, toast the almonds until they just turn golden brown, about 2-3 minutes. For the whipped cream, chill a medium sized bowl for 2 minutes. Then, using an electric hand mixer, mix together the heavy cream, vanilla extract, and 1 teaspoon sugar until it forms a whipped cream, about 1-2 minutes. 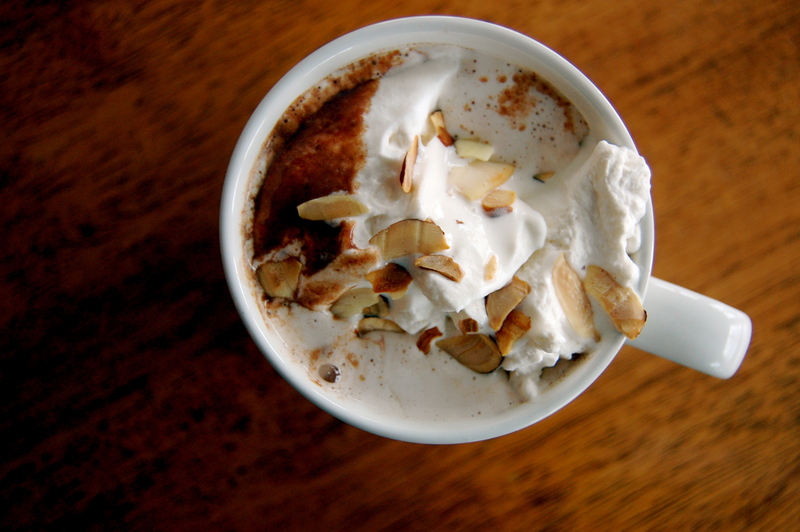 To assemble your toasted almond hot cocoa, pour into a mug, top with whipped cream, and sprinkle with the toasted almonds. I also apologize in advance for any hot chocolate addictions this may caused.